I was supposed to protect them. I was supposed to keep them safe, but wherever I go more and more people are losing their lives, and nothing I do can save them. After so much loss, my family is breaking apart at the seams. The Taoree Legion is winning this war. No matter what we do or how we fight back, we can’t seem to gain any ground. They’re one step ahead of us at every turn. The world is crumbling before my very eyes, and I can’t seem to stop it. I don’t know how I’m going to do it, but I swear with everything I am that I will kill Emperor Thelonious Serparla for what he’s done to us, to my family, to the human race, to the entire world. By god, I will take him down, or I will die trying. 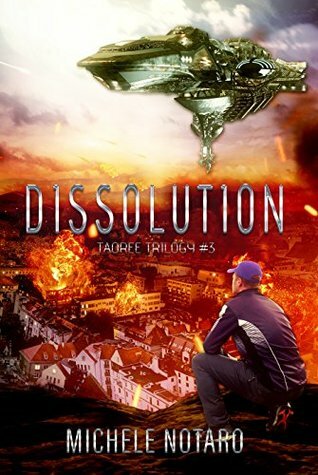 Dissolution is Book Three in the Taoree Trilogy and is meant to be read as part of a series. This book brings the conclusion of the series, and the happy ending we’ve all been waiting for. The war is raging between the Independents and the Legions. Thelonius’ army seems to win every fight, seems to know what their enemy is going to do. Jeremy and his family need to find the mole hiding among them because they need to find a way to bring Thelonius down and end this war. They didn’t expect to discover something that will probably help them, but also a new threat that can change the end of this war and the future of their people—Taoree and Human. Dissolution is the last book in the Taoree Trilogy by Michele Notaro. I loved this book, and I was sad to let them go. Jeremy and Orrean are bonded, they are balu and crazy in love. Even if the war keeps killing their friends, brothers-in-arms, they still have hope to win. They’re a united front, even when they’re mad at each other, they’re unit and ready to do anything to protect the people they love. I adored these two guys—they are beautiful together. I love how united they are, even when things aren’t easy for them. This book was the culmination of their story, of their love and it was breathtaking and beautiful. I cried a lot…again. We lost someone…again. It broke my heart, but it was consistent with the story and the plot. The MCs are all fabulous, and I loved to see their evolutions, from teenager to survivor, to soldier to adult. This book is the last one in this trilogy, and finally, we have the end of the war, how they fight Thelonius and a big twist at the end that I didn’t see coming at all. Well, actually, we learn two major things that I didn’t see coming, but that explains a lot of things. The rhythm is different from the first two books, it seems slower and less dynamic, but it made sense to me. In the first two books, they were on the run and trying to find their feet in this war. In this book, the MCs are installed in their role, embraced their fate and planned how to win, not to survive this time. The author transcribes this really well, and even if the rhythm was different, it was consistent in the whole series. I adored this trilogy, I’m usually not a fan of dystopia, I most of the time find it depressing, but this series is really good, and even If I cried a lot of the time, I couldn’t stop my read. It gives me a lot of feelings from sadness to fear to excitation to love. It was really good and well written. Now I can only wait for The Taoree Chronicle series to start with Wes’ book. It’s my favorite character, and I can’t wait to read about him. It’s a huge 5 stars for this incredible family!